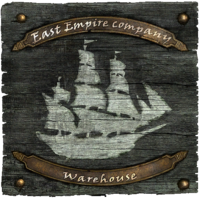 The East Empire Company Warehouse is a warehouse on the Solitude docks immediately southeast of the city. The building is the headquarters for the East Empire Company in Skyrim and their main warehouse. The entrance is locked with a leveled lock and you will be considered to be trespassing if you enter, additionally there is a Solitude guard patrolling just outside the entrance. Normally the warehouse is manned by Dockworkers, the Dockmaster, and Snorreid, as well as a compliment of three Solitude Guards patrolling inside. At the far side of the docks there is an entrance to Brinewater Grotto, which has a second entrance near Solitude's Lighthouse. There is a large amount of food, clothing, potions, weapons and armor in the warehouse as listed below. When the quest Scoundrel's Folly is started the Dockworkers are replaced by Wardens, who are hostile to all trespassers. * They replace the Dockmaster, Dockworkers and three Solitude Guards during the related quest. The entrance leads into a shack-like structure with a table on your right and a piece of charcoal on top. The inside of the warehouse is basically indoor docks with berths on both sides of the building with the waterway between them. There is a path along the waterside leading past stacks of crates bearing the east empire crest and another shack containing nothing but an empty table. There are shelves filled with all manner of items, including; crates, bales of straw, sawn logs, furniture, food barrels, and many other items. The shelves form passages between them. Near the start of the shelves, you can climb a ramp, where you can climb a split log to the top of a shelf with an entire rib cage of a mammoth on top. From here you can jump across to another shelf opposite, where there are several crates and an end table with a copy of Speech skill book The Buying Game on top. There is a large urn ahead and above this, on a shelf is a novice-locked chest. After you pass a pile of carriage wheels, ahead there is a flight of wooden stairs leading down into the water. Around the corner, by several unusable anvils and a selection of ingots is a copy of the Smithing skill book Heavy Armor Forging. Just past this is a master-locked gate, but there is nothing in the area behind it. To the right of this is a flight of stairs leading up with a novice-locked chest on the ground behind it. At the top there are more stairs leading up, at the very top you will find Snorreid either sleeping on one of three bed rolls or sat at a table eating. There are more shelves here holding many food barrels, several dressers of random clothes and an apprentice-locked chest. There is a warden guarding the first boat docked which has an apprentice-locked chest on board. There is a rowboat on top of one of the shelves and an adept-locked chest under it. Just after this there is a boat that has been raised out of the water for repairs with stairs up on this side, six bowls of troll fat appear to be being used to waterproof the boat and deck. Another warden patrols around this boat, with a fourth on the far side that is often within earshot. Beyond the boat under repair are more shelves with wide stairs leading up at the end of these. Just beyond the stairs up, are stairs leading down into the water. Beyond these both are more shelves with a tall ladder leaning against them. You are able to climb the ladder to the third shelf where there is a novice-locked chest. Next to these shelves is another flight of stairs down into the water and more shelves continue to the end by the large sea doors. At the very end is a table with the business ledger on top. Returning to the stairs leading up, at the top are more shelves with two life-sized statues to Dibella on the top shelf, that you cannot interact with. Once past these the path climbs steeply to the Dockmaster's cabin which have double wooden doors, that are kept unlocked. The cabin is in a poor state of repair with large holes in the walls and roof. Inside there is a long wooden table against the southwestern wall with the East Empire Shipping Map, a random dagger, twenty-one loose septims, a small coin purse, a silver ring, a silver amethyst ring, a gold and a leveled ring. The map can be sold to Delvin Mallory as part of the quest The Litany of Larceny. A dresser to the left of the table holds a selection of clothes and has a wolf pelt on top. There is an unowned single bed opposite the entrance, with a small coin purse on the floor by the foot of it and a pheasant breast on the floor beside it. There is a small round table with a bottle of alto wine, a bottle of wine and a loaf of bread on top. There are two bunches of dried frost mirriam and a bunch of dried elves ear hanging from rafters and against the northeastern wall a cupboard and set of shelves that hold; five bottles of alto Wine, four bottles of wine, a gourd, a garlic braid and twelve common books. To the right of these is a bucket containing another gourd. Back at the bottom, descending the stairs into the water, beside the ones you've just climbed, and at the wall turn north. This is a dead end until you arrive here during the related quest. At which time you pass between shelves to a concealed entrance to the main hidden part of Brinewater Grotto. † There is an additional pair that you are unable to interact with. ‡ These are in addition to those being used to repair the ship. The Warehouse's stocks respawn and will prove useful to anyone in need of minor potions, troll fat, giant's toes, food and drink, iron weaponry, and general clutter. There is a Danger shadowmark to the right of the entrance door. This is due to the quest Scoundrel's Folly when the workers are replaced by hostile wardens. This is the only location in the game where you can find a fixed set of loose noble clothes. There is a bottle of alto wine on top of one of the piling posts near the first flight of stairs leading down into the water. Under the water is a single unlocked chest containing only minor loot. It is just to the south of the berthed boat. There are two pairs of boots you cannot interact with. This page was last modified on 13 April 2019, at 15:34.